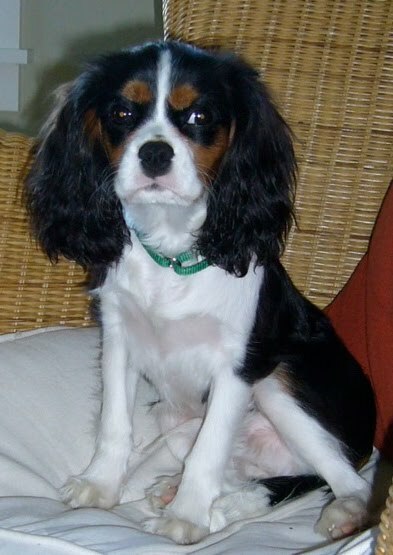 Also known as Winnie B From the Hundred Acre Woods, this savvy spaniel has accomplished much in his first year of life. He’s the able assistant and muse to writer Kirby Larson, helping her complete two historical novels, The Fences Between Us (Scholastic, Sept. 2010), the first new Dear America title in five years, and The Friendship Doll (Delacorte, Spring 2011), as well as pairing up with cousin, Dash Nethery, to pen the two narrative nonfiction picture books mentioned in this interview. Not content to rest on his writing laurels, he is also a therapy dog-in-training, with his sights set on entering the Reading with Rover program. Winston lives in Kenmore, Washington; with his pack-mates, Kirby and Neil. Dashiell A. Nethery is a New York Times, USA Today, and Publisher's Weekly bestselling Baby Muse at the tender age of one and a half years and has collaborated with his beloved cousin, Winston B. Larson, on the creation of Nubs: The True Story of a Mutt, a Marine & a Miracle (Little, Brown, 2009) and Two Bobbies: A True Story of Hurricane Katrina, Friendship and Survival (Walker, 2008). 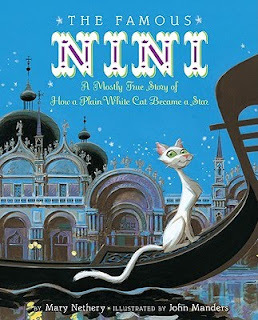 His newest muse-inspired book, coming out in June 2010 from Clarion, is The Famous Nini: A Mostly True Story of How a Plain White Cat Became a Star, illustrated by John Manders. Dash was raised in an orphanage in Atlanta, Georgia; until the age of three months, when luck shone upon him and he was discovered by his true parents with whom he now happily lives in Eureka, California. When he's not hard at work in his muse basket, he likes to conjure up low-tech games like Grab a Leg and Run or Sneaky Spy. He also enjoys lounging, dancing with his favorite ribbon, sampling exotic cuisine, and listening to picture books. Due to the sudden and mysterious disappearance of today's guest authors, Kirby Larson and Mary Nethery, I've invited these two lesser-known but equally charming luminaries of the writing community—Baby Muses, Winston B. Larson (dog) and Dashiell A. Nethery (cat) to chime in. Perhaps you could shed some light on the whereabouts of Kirby and Mary? WB: Did someone say "treat"? No. Well. My pack mate, Mama Dog, is on the prowl, sniffing up a new story at this place called Starbucks. Dash: My mom is out looking for somebody called Jimmy Choo. I think he's an editor. How did you begin writing together? Dash: WB and I don’t write together. We’re in a higher echelon —we’re two fierce Muses! WB: No, you goofball, she means how did our moms begin writing together. Dash: That’s why I love you, WB, you’re the French to my fries, the woof to my meow, the . . .
WB: We’ve only got a few words, let’s not waste them. Dash: Right again! Our moms have been trading manuscripts back and forth for about seven of their nine lives, scratching around to help each other tell the most powerful story possible. WB: One day, Mama Dog heard a talk at an SCBWI meeting about collaborative writing. She thought it sounded like fun, and she couldn’t think of a better buddy to write with than your mom. She asked, and Mary jumped on board. WB: I’m pretty sure they dig them up from lots of different places. Dash: So true, but without my mom, there wouldn’t be any stories! 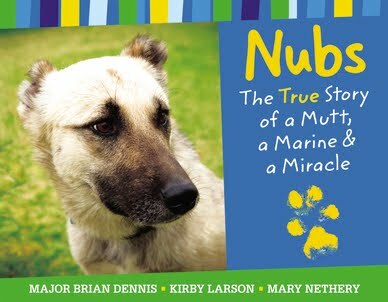 She heard about our buddies, Bobbie Dog and Bob Cat, (Two Bobbies: A True Story of Hurricane Katrina, Friendship and Survival) on CNN’s Anderson Cooper 360, and later, read about Nubs (Nubs: The True Story of a Mutt, a Marine & a Miracle) in the newspaper. Frankly, as the high-powered muse that I am, I pointed her in the right direction every time. WB: What would they do without us? Dash: Live lives of quiet desperation, to be sure. WB: And collect a lot more rejection letters! 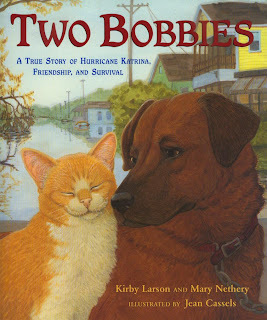 How do Mary and Kirby know when a story is the right story for them to tell? Dash: The purrfect story for them to write together focuses on the superior species-- animals. WB: Finding the right story can be “ruff.” They explored thirteen different ideas before digging up the bone about the Two Bobs. What do they look for in a true story? 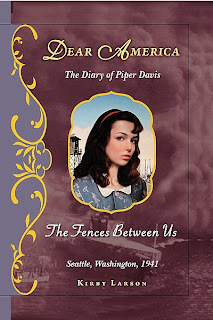 WB: I have chewed up a couple of Mama Dog’s journals, and I can tell you that I ate a lot of notes about wanting to tell stories that offer hope. Dash: My mom says she and Kirby look for stories where the animal does something extraordinary that illuminates people’s understanding of life and helps them to be kinder than they thought they could be. WB: We’re extraordinary, aren’t we, Dash? Maybe we should put the idea out there for them to write about us. Dash: Good one, WB. And BTW, try eating frosting, not paper. 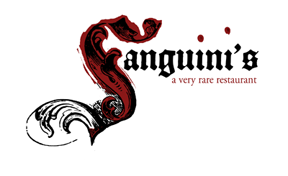 It’s a lot tastier and more respectful of our profession. You don't live next door or even in the same state! How do your moms work together? WB: Well, they wouldn’t get anything done without us Baby Muses, that’s for sure. I spend a good part of every day chewing up, I mean, cleaning up, Mama Dog’s office. Dash: Do you get extra allowance for that? The only thing I clean is me, then I sit in my muse basket on top of a stack of paper and feed my mom ideas about how to respond to Kirby’s drafts and Kirby’s suggestions on Mom’s drafts. You see, when they’re working on a story, they each take a section and write a first draft. I also help Mom by hitting SEND when she’s done. WB: I chew on the computer cords. And I sit on Mama Dog’s lap during their Friday afternoon working phone calls. Mama Dog sips something out of a stemmed glass while she talks. The longer the talk, the more sips she takes. Me, I just get up every now and then and take a slurp from my water bowl. Dash: Purrsonally, I prefer kitty cookies during those Friday afternoon chats. And our moms can chat for hours! How do Kirby and Mary ensure the authenticity of a story told from an animal’s POV? WB: I’ve seen Mama Dog down on the floor in her office, trying to look at things from a four-footed point of view. Dash: It should be purrfectly obvious – they run everything by us. They respect the animal’s story, telling it as authentically as they can. What techniques do they use to research their stories? Dash: They spend a lot of time on the internet trying to gather all the information they can. For Nubs, they watched every news broadcast and read every article and blog post they could about Brian and Nubs. Then they compile a list of questions they still need answers to and begin interviewing, which they like to do together. Humans have a pretty poor sense of hearing, so it helps if they can both be listening at the same time. 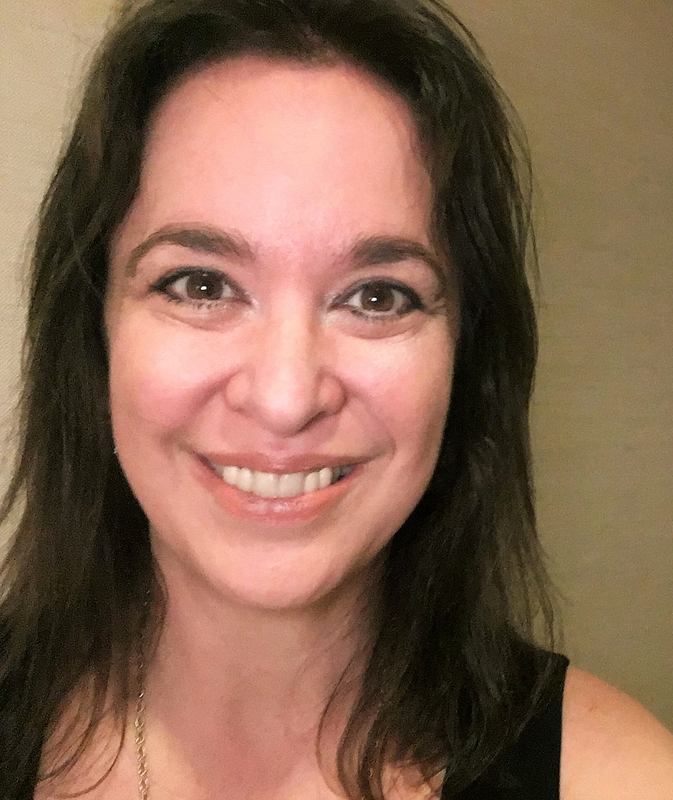 WB: Don’t forget that sometimes they travel to conduct interviews in person, like driving to Medford to meet Melinda, the angel who adopted the Bobbies, or flying to San Diego to meet Brian and Nubs. Dash: I look at those trips as opportunities for you and I to act out and get more treats. I wonder when the next one is coming up. . .
Give us the inside scoop on something surprising learned during the research process for Two Bobbies and Nubs. 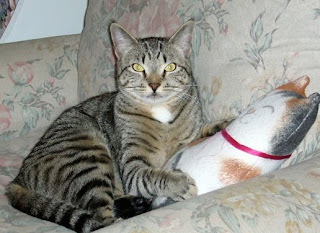 Dash: My mom was surprised by the way Bob Cat walked around his house as if he could see. 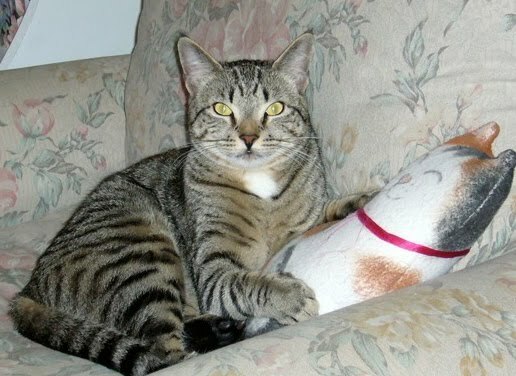 Melinda told my mom that when Bob Cat got to his new house, he spent a lot of time just walking around the edges of the rooms and around all the furniture. Then it was like he’d made a map in his head and walked through the house following his map. That should not have been such a big surprise to her; after all, I’m a cat and cats are brilliant. WB: The biggest surprise for Mama Dog was that, after writing two books featuring dogs, she realized she really, really wanted to be owned by one! So that’s how I came to live with the Larson pack. Describe working with editors and illustrators on a narrative non-fiction book, as opposed to fiction. WB: I’ve watched Mama Dog do both kinds of books and I can’t see much of a difference. Dash: On the other paw, they seem to work even more closely with the editor and illustrator making sure every aspect of the book reflects the true story. Facts are facts. So, what makes it all work, in the end, two writers writing one story? Dash: In a meow? Respect. Dash: Back at ya, buddy! Websites for Winston and Dash are under construction, but if you want to know more about their missing moms you can go to www.twobobbies.com or www.thestoryofnubs.com. Check out the book trailer for Two Bobbies: A True Story of Hurricane Katrina, Friendship and Survival (Walker, 2008).